In idle moments when we're not slaving over the details of Sideburn 2, we dream of being such accomplished racers that we have a brolly dolly. Or a team of them. 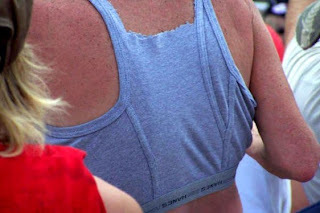 And ours would wear hillbilly vests like this. Look at it. It's a pair of Y-fronts with the crotch cut-out. Genius. 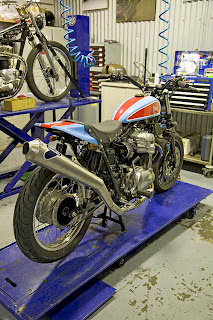 In the UK, built by our good mate Jason (he built the Triumph in SB 1). 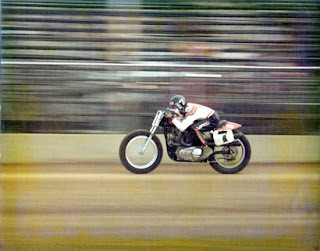 He built it to race, took it to a practice and got so excited he's now spending a fortune on a race bike from the States. 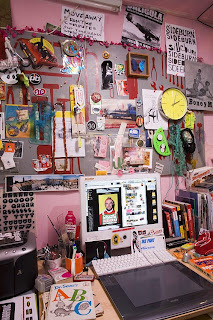 So this tidy thing's gotta go. We've seen it up close and it's neat. The bike is in the English Midlands and will come with a front brake if you want to daylight MoT it. It's has a new chain (not pictured). 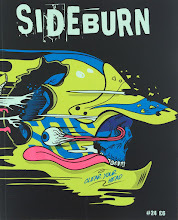 Sideburn is produced in England and Holland, then printed in Wales and sent around the world. This is what the two SB offices look like. 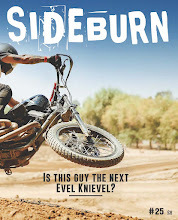 A pin-up poster of a half-naked Jay Springsteen with a couple of tires under his arms? 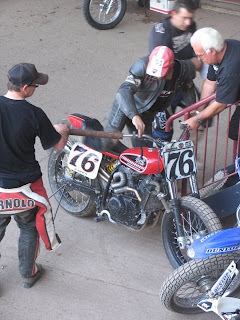 Team Skooter Farm straightening Captain Highside's bars with a a length of scaffold tube at Mildenhall last year. 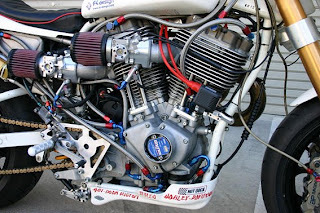 That's his homebuilt KTM-framed big bore Honda TransAlp.It flies. He flies. The Mildenhall race is cancelled this year. Please come out and support UK short track or there will be more cancelled races. 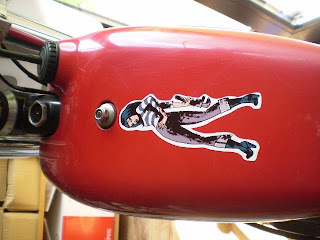 The Mighty Motocycho sent us some stickers and a new copy of their new zine. 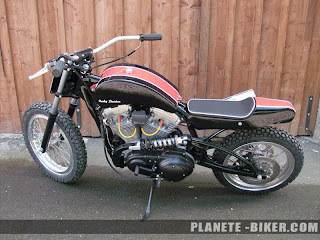 This is their dirt tracker. We knocked it off their blog. Love it. 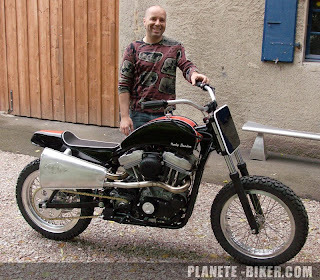 From France, a bizarre,1200 Sportster, with side-mount monoshock, modified (new?) 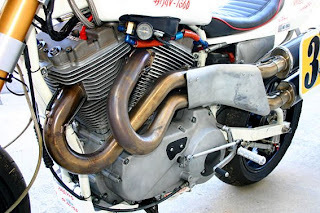 frame and swingarm. We can't read French, but we think the steering angle has been sharpened from 30-degrees to 24. We also think it says if you want it'll cost 12,000 euro. 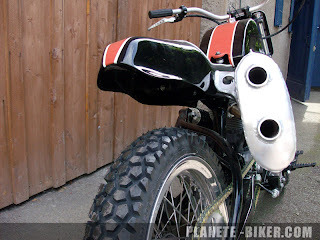 Built by Laurent Dutruel at Zen Motorcycles. His website link doesn't work. If anyone finds it, please let us know. 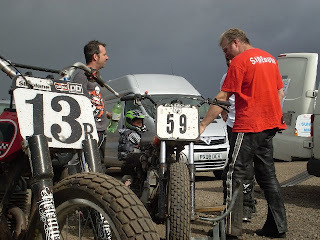 They weren't on track at Scunthorpe, but I reckon they could still beat me on a good day. It'll make you want hyena. We started the frantic ringing round and web checking on Saturday night, after the cancelation, of the race. 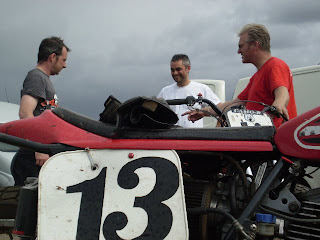 And we found out there was a practice day at Scunthorpe speedway track - the Eddie Wright Raceway, a small oval on a former piece of wasteland, in the industrial north of England. 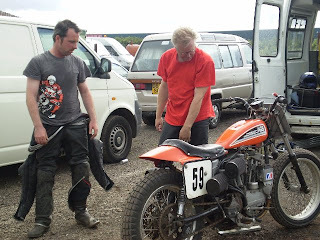 I took my Wood Rotax, Randal and Steve brought their old XR750s, Jason turned up on his newly finished SR and Colin brought his CCM FT35. Steve even let me have session on his XR. Thanks Steve. Great day. These photos are by Rach. I shot it all on film (not digi) so more pics soon. 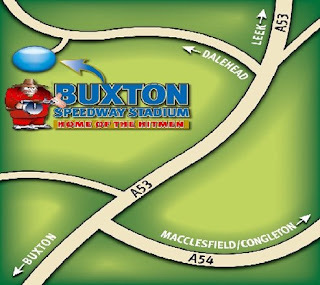 Got a call at 9.30pm to say tomorrow's race at Buxton is off. Balls. Flat Tacking Frogs! Whatevever Next? 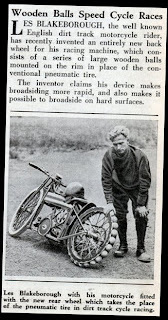 Why Flat Tracking Czechs Of Course! 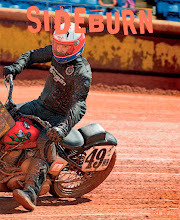 Our American brothers don't hesitate to make a three-day return trip in their team Winnebego to some Godforsaken backwater, just so they can jostle with like-minded nutcases thrashing around a dirt oval. If us Europeans drive that far - even in a beat up Transit van, we'd need our passports & would find ourself in another country, speaking a different language (but more likely shouting English ignorantly) and sampling a different shape of sausage. Hence its not something we do every weekend. But the boys that compete in the MEFO Cup, are cut from a different cloth. They're soldiers and march hundreds of miles, kilometers and furlongs to compete for the buzz and an el cheapo paper weight sized trophy. Back in June, 28 riders from 7 different countries met up in Germany. A previously un-heard of team of Frogs bounced out of the woodwork and onto the third rung of the podium! 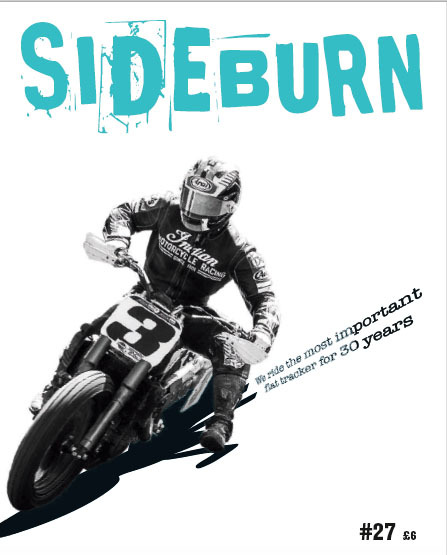 Like several other now successful Euro Flat Tackers, they have cut their teeth on Speedway, Grasstrack, &/or SuperMotard turf. 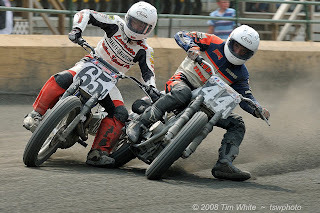 Flat track in Europe is still in its infancy. The Italians were the first to 'discover' it back in the 80s and there are still a scattering of Wood Rotaxs to be found there. However interest petered out, only to be rekindled in the last few years, with small but noticible movement on the Richter scale in England, Italy, Holland & Germany simultaneously. Things have now reached cult status - at least on an underground level. Dare we say it? Street Trackers will be the new (styling) flavour of the month for big manufactureres & DIY customizers, now that Street Fighters, Super Motard, & Naked Sport Bikes are looking a bit passe? - All comments welcome. And the Czechs? Last week saw a MEFO cup round being held at the Marianske Lazne circuit in the Czech Republic. Don't know where it is? 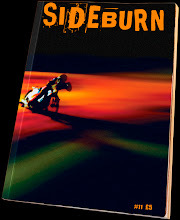 A whole new chapter, or maybe even book, is being written on our favourite sport. PS That front brake & mudguard on your road bike looks well sissy GO RIP THEM OFF NOW! Built in Britain, inspired by America, ridden by an Italian. Marco Belli in full flight on his latest generation CCM. See him live in the UK and Europe. 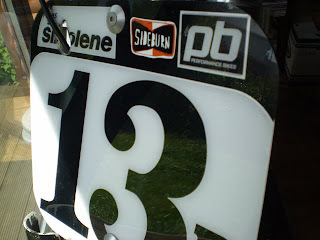 Check www.shorttrackuk.com and www.flattrack.eu for race dates. 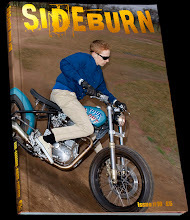 On the Sideburn lap-top and the Sideburn Wood Rotax. Looking good. Our friend Justin at Glory is selling this beauty. We can't get hyperlinks to work, so you'll have to cut and paste. The bike is in LA, California. 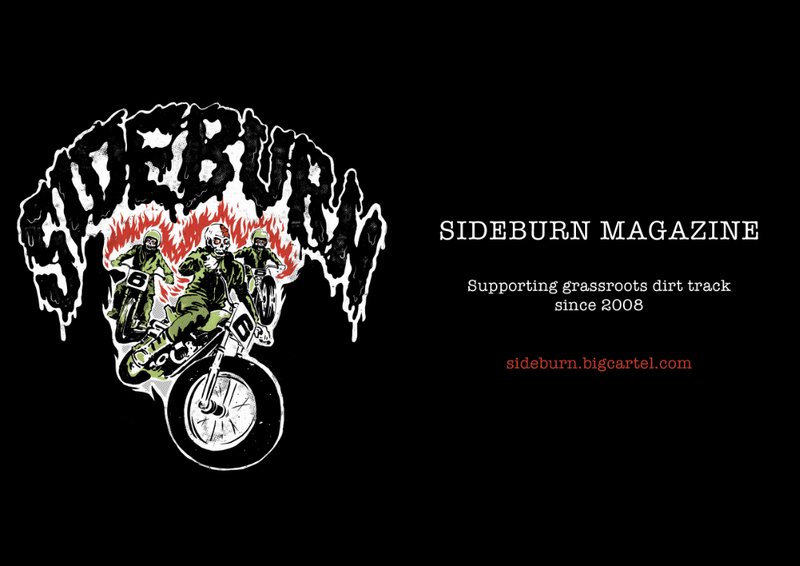 Sideburn's GI will be racing with the Lancashire Grasstrack Club at Buxton speedway track (the UK's highest oval) on Sunday July 20. 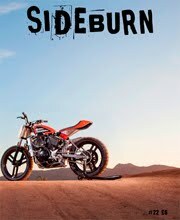 Steve Hillary has said he's going to race his XR750 (see http://sideburnmag.blogspot.com/2008/04/1977-xr750-ready-to-race-in-uk.html or go back to April 10). 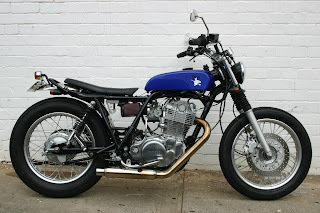 And Jason, who built the modern Triumph street tracker in SB issue 1, says he'll be there with his new Yamaha SR racer. Peter boast, the king of UK short track, will be there too. 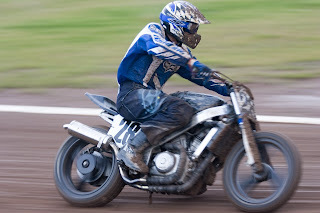 There are two short track classes, and about a dozen grass track classes. It is on a speedway short track though. Practice from 11, all done by 5pm. 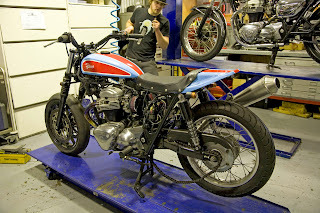 From Carby Tuckwell at Deus HQ. 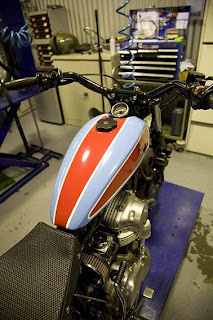 Super neat street tracker in progress. Doesn't take much to take those Kwak retros look good. The lens on Tim White's camera is crafted from pure Aztec crystal blessed by the sun God himself. Every picture is pin sharp, you can even smell the smoldering shingle. 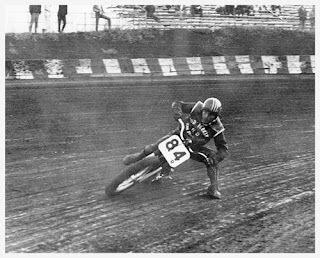 Here child prodigy Brandon Robinson #44A - featured in SB#1, when he was an amateur - pips Cory Texter #65A at the Frederick County Fairgrounds in Maryland. Why bother making a 5 hour round trip to watch the races when you can just log-on to Tim Whites site http://tswphoto.smugmug.com & enjoy the action up-close from the comfort of your own home? 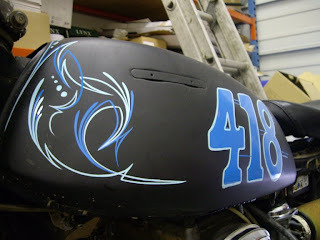 Can you believe someone races this in the UK Short Track series? It's a Honda Hawk (or Bros), still on 17s, running supermoto slicks. Steven Coles is a trooper. 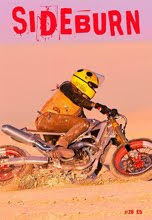 And he rides it hard. 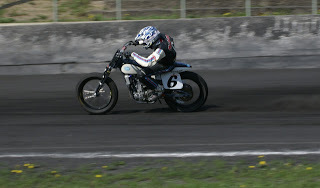 Check out the fixtures on www.shorttrackuk.com and come and see him. He might even break his collarbone for you. Or mine. 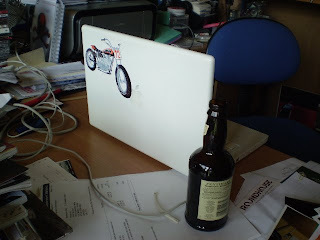 Hot Dock's mutant race tracker preparing for action in Japan. 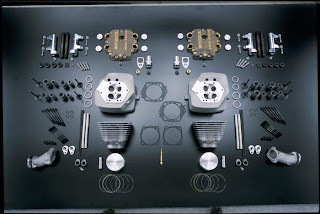 And a detail shot of its guts. 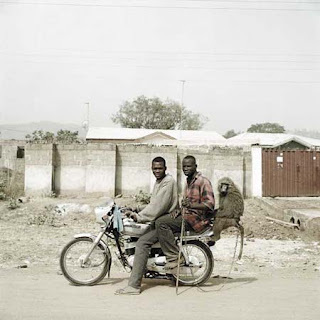 see one young Turk drifting his Vespa. 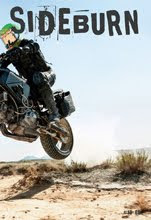 Just to add; if you don't even ride a motorcycle, you still have no excuse. 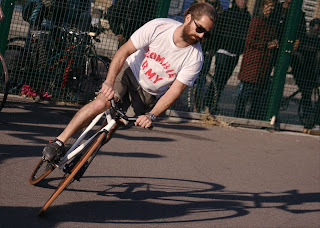 Yorgo of Zombie Army drifts his 'fixie' . 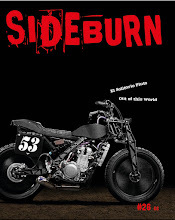 Use the Sideblog's work in progress labels to find related items. Down the bottom there. In green. That's it. 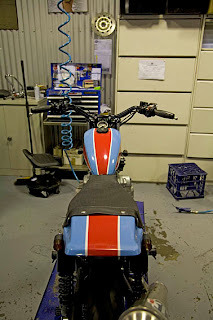 The Sideburn/Skooter Farm Racing Wood Rotax's Mikuni. 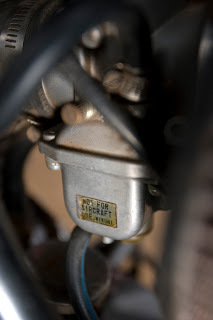 Fuel injection doesn't come with stickers like this. Hail, hail Mikuni-san. 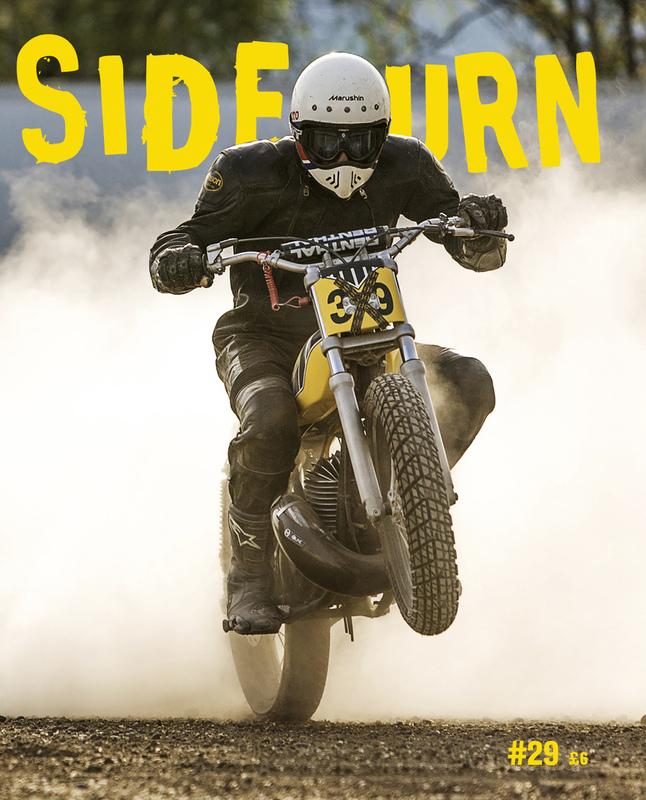 Sideburn has officially appointed Deus Ex Machina as its first Australian dealer. Lima, Ohio. Boy-oh-boy, that place sounds cool for someone stuck in rain-lashed England. 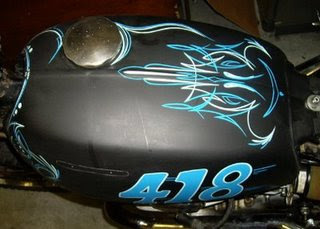 Now just because your bike sports H-D™ badges on its tank, don't make it cool. In fact here at SB, we are very picky when it comes to Milwaukee heavy metal. 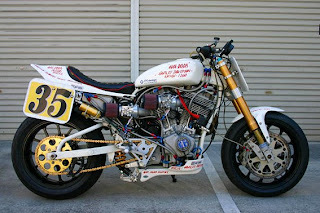 But this tarmac mongrel; built by Keiji Kawakita in Tokyo, is more frisky than a Glaswegian pit bull & we suggest you don't dare pat its radial 4 valve head. 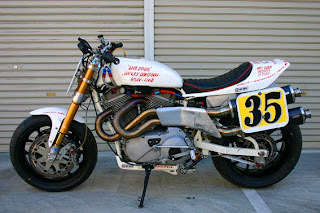 Hi, I think I promised you guys a few pics of this years Outlaw Class at Ventura. Hope you find them amusing. 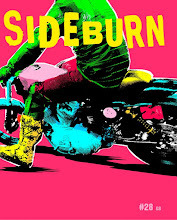 Sideburn, adesso in vendita a Milano!